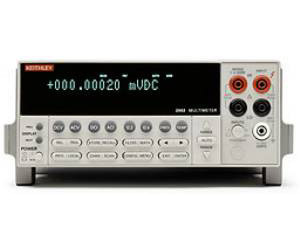 The Model 2002 81/2-Digit Multimeter offers all the capabilities any system integrator could want when designing a production test system for high-precision components. It starts with all the capabilities of the Model 2001, then adds an extra decade of resolution and broader DC voltage, temperature, and resistance measurement ranges. An “open lead” detection function makes it easy to identify problems that could lead the system to pass components that should have failed a test. Built-in digital I/O capabilities and a pass/fail testing function simplify connecting it to a variety of handlers for fast, efficient device binning and sorting. The Model 2002 offers a variety of advantages over other 81/2-digit measurement instruments of comparable accuracy, particularly its DC volts and resistance measurement capabilities. For example, its measurement performance is specified for a ±5°C environment, not a ±1°C environment like many others, and its performance is specified for a wide range of measurement speeds.